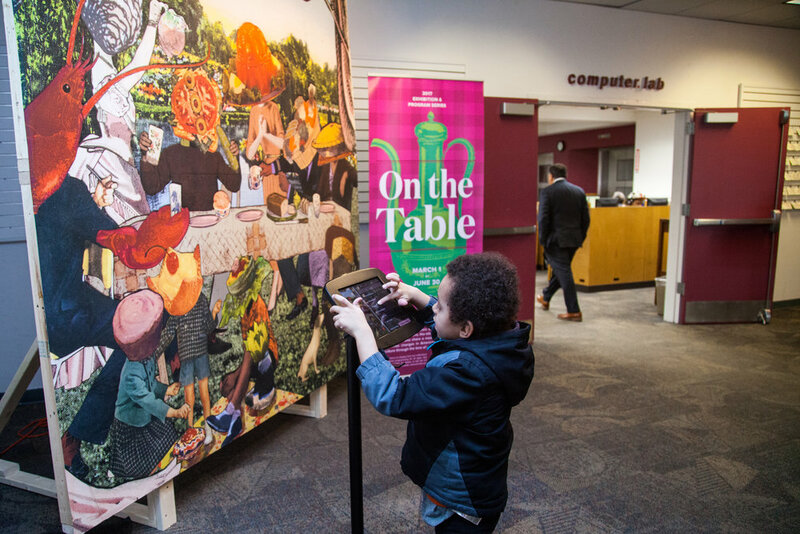 In March of 2017, I installed a mural at the Providence Public Library in connection with their Spring exhibition, On the Table. Part of a yearlong Creative Fellowship, this work was created using resources in the library’s collections. Throughout the duration of the project, I worked closely with library staff; collaborating with Special Collections to perform research. Starting small-scale, I integrated dozens of digital scans into a rigorous exploration of both analogue and digital, collage and drawing processes. The final illustration was enlarged to 8’ x 8’ and installed as wallpaper on a free-standing wall. I teamed up with the library’s web technician to create an interactive an ipad kiosk that invites viewers to discover how source materials from the collection were used to create the collage. Explore kiosk from home & read full artist statement.